The Support Postgrads. Australia’s Future. campaign aims to bring issues important to postgraduate students into the national conversation around the 2019 Federal Election, and to encourage voters to consider these issues when deciding how to fill out their ballot on May 18th. Postgraduate students are an integral part of our higher education and research systems, but often have one of the quietest voices in higher education debates. This campaign aims to change that. 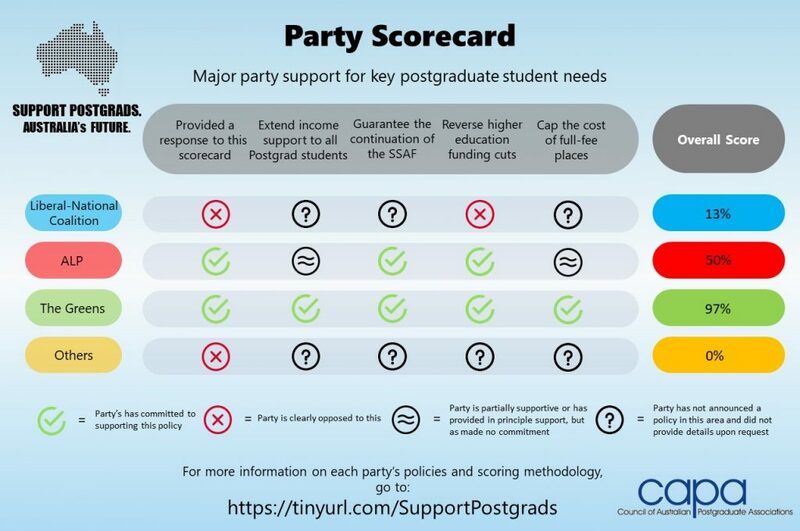 We encourage voters the read the full report below and discuss the importance of postgraduate issues with your local candidates. If additional information is provided to CAPA or announced during the course of the campaign we will endeavour to update this report and associated scorecard as soon as possible.